The third William Blackett was of a very different character to that of his commercially astute father and grandfather who had established the vast and lucrative Blackett lead and coal business, bought landed estates in Northumberland and the ancient family seat of Woodcroft in Durham. According to most accounts the third William lived up to the stereotype of the dissolute third generation, fond of riotous living and spending well beyond his means, considerable as they were. 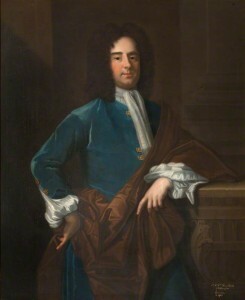 However, in the absence of much primary material concerning the management of the business during this period, a degree of scepticism is possibly called for, especially as some of those third party accounts might have been influenced by William’s alleged dalliance with Jacobitism immediately before the 1715 rebellion -either because he was seen as suspect by loyalists, or as weak-willed by the rebels. He inherited at the age of just 15. The business was in the hands of his father’s trustees, William Davison and John Wilkinson, and his father William II was not entirely free of debt himself. Members of the Allgood family, and John Ord, a sharp Newcastle lawyer also took a close interest in ‘serving’ young William Blackett over the following years, perhaps with their own opportunistic interests also in mind. The long late 17th century boom in the lead industry itself appears to given way to a deep depression in the years after 1710, possibly severe enough to have exhausted the resources of the strongest of businesses. Certainly the business was heavily encumbered by debt by the time of his death in 1728, £70,000 being owed to Guy’s Hospital alone. Such was the inheritance of William’s cousin, Walter Calverley, along with the requirement to marry William’s illegitimate daughter Elizabeth Ord within a year.